I don’t which I’m more excited about, the new and improved work surface I’m using for my sharpening station or the little addition I just added the other day? Sharpening my hand planes and chisels has always been one of those things I begrudgingly did. It’s not that I didn’t get good results, it’s just to achieve them I felt like I was jumping through hoops to get there. If you’ve seen one of my shop tours you’ve probably saw my previous sharpening setup, a re-purposed roll-around microwave cart. 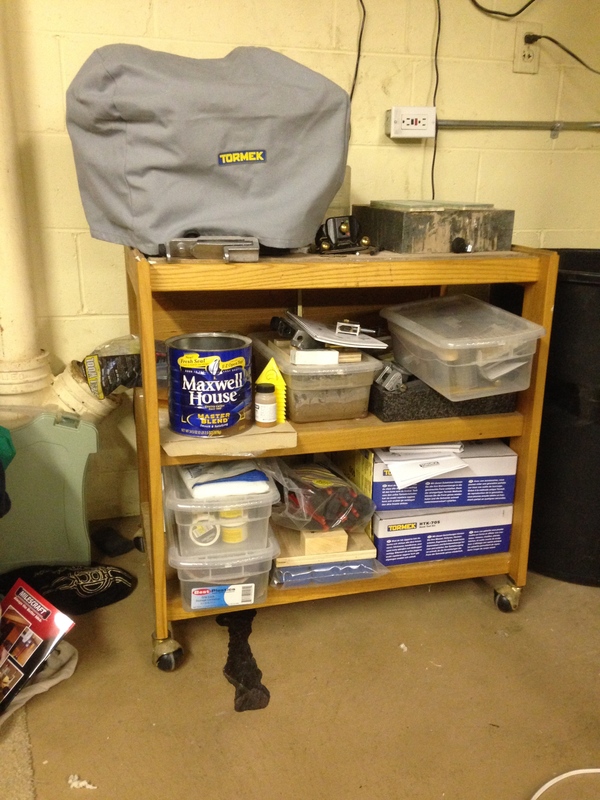 It did a decent job of storing all my sharpening accessories, but where it fell short was on having enough work surface to lay out my stones so I could get to them quickly and easily. With this new sharpening station (which is actually once again a re-purposed kitchen storage item) I have plenty of work space to lay out everything and still have room to spare. And because of this extra space, I decided I really wanted to have a setup that would make using my waterstones even easier, because up until now, my biggest complaint with them was occasionally having to “chase” them across the work surface when using them. On today’s episode I’ll share with you a little upgrade I added to my sharpening station that I’ve been wanting to do for a long time now. The result will eventually be me honing and sharpening my blades more frequently! While I’m on the topic of sharpening stones, for current Chortle & Woobie-level Patrons of Matt’s Basement Workshop, it seems the perfect time to discuss their care and maintenance, so that’s what we’ll be discussing in this episode’s bonus content. Not a Patron of the show? Please consider joining. For more information visit www.patreon.com/mattsbasementworkshop. I wish I had this much sharpening information years ago! To Upgrade or Just Buy New? matt I love all your videos but I think I would have caulked the edges of the metal plate before using it, just to keep any stray water from rotting or warping the top. No reason I can’t go back and do it before it’s too late. Not a bad idea! Now correct me if I am wrong here, and of course with all due respects to your impact on the YouTube circuit, but do you think maybe… just maybe you may have your Shapton stones a wee bit upside down?